Ana Faye is an award winning fashion and accessories designer, whom has been lecturing and teaching fashion design and pattern drafting, both privately and also in colleges such as St Aneglas Sligo and The National College of Art and Design, as well as running educational programs with the DCCOI for the past 8 years. Her experience hails from her vast knowledge and experience in the fashion industry, as a fashion and accessories designer in companies in Italy, London and China as well as running her own successful leather handbag label ANA FAYE for the past nine years. Ana has an honor’s degree in Women’s wear and a Post Graduate degree in Pattern drafting from the prestigious Central St Martins College in London. Ana’s educational ethos like her business focuses on the meaningful mergence of professional practice. Previous experience in the design sector has made her proficient in the organization and administration of a variety of different design and manufacturing projects. In its many forms, design makes an increasing contribution to the cultural and economic life of contemporary society. Ana’s aim is to initiate and support creative thinkers who can apply their skills in any chosen forum. Anas short courses are designed with complete beginners in mind, but also cater for the more advanced learner and are done in a relaxed and easy going environment in the Enterprise and Technology park in Strandhill, Sligo. 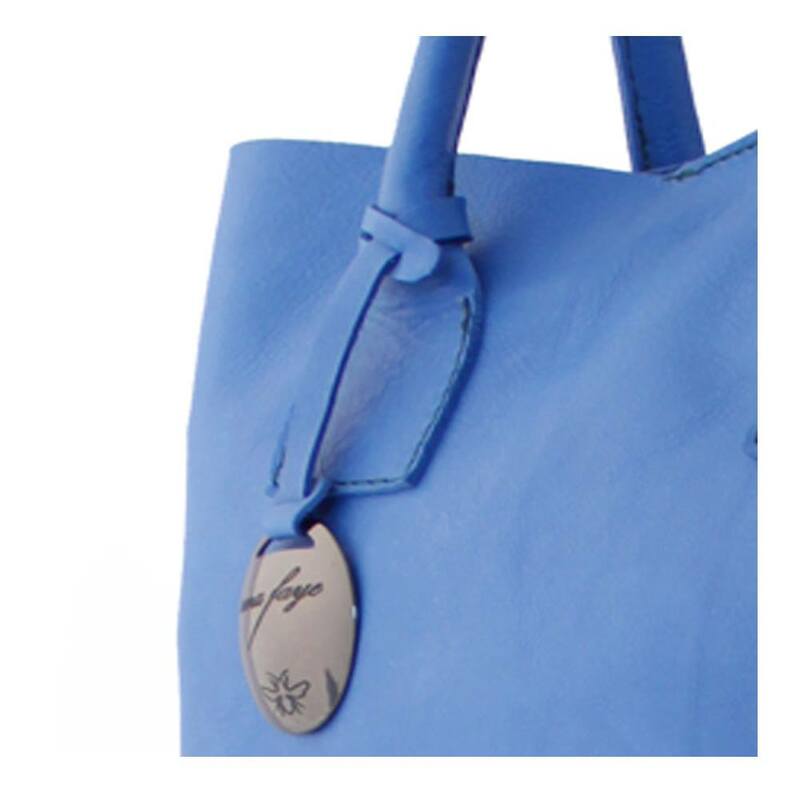 This wonderful course is a great introduction to making a handbag. On this two-day course you will be walked through basic construction techniques required to make a leather handbag from scratch. On the first day you will choose from 4 different handbag shapes. We have pre-prepared patterns for you to use so you don’t have to worry about any complicated pattern cutting on this course. You are welcome to customize your chosen designs slightly if you feel confident. This course is a chance to learn how to make a fully lined soft leather bag with different types of pocket detail and handle options and leave with skills you can use for future bag making projects. Day 1: Select pattern to use, customize pattern, discuss chosen materials, cut leather & lining, practice on the industrial machines, start to sew lining. You have the option to work with domestic or industrial sewing machines. We have a Typical walking foot cylinder arm machine and 2 flat-bed industrial sewing machines, they are all fitted with slow speed motors so they are really easy for even a beginner. We now also have a skiving machine to help with reducing the thickness of the leather in the seam lines. You are welcome to use either depending on your choice of materials, but our aim is for students to produce professionally finished bags and we’d recommend using an industrial machine to get the best results. We will also use traditional hand sewing technics. Our classes are very small (max. 6 students per class, courses run with a minimum of 2 students), so there is plenty of one-to-one tuition. Courses tend to fill-up fast so if your requested course date is already fully booked we will be in touch to discuss alternative dates that suit you. This course is €200, if you would like us to supply the leather and all components then you can pay the extra €50. For booking and payment of deposits please email info@anafaye.com or you can use this link to book. A fun evening workshop, which will introduce you to working with leather. Throughout the weekend, we will together come up with a simple design for a leather clutch using hand sewing techniques and rivets to piece it together. 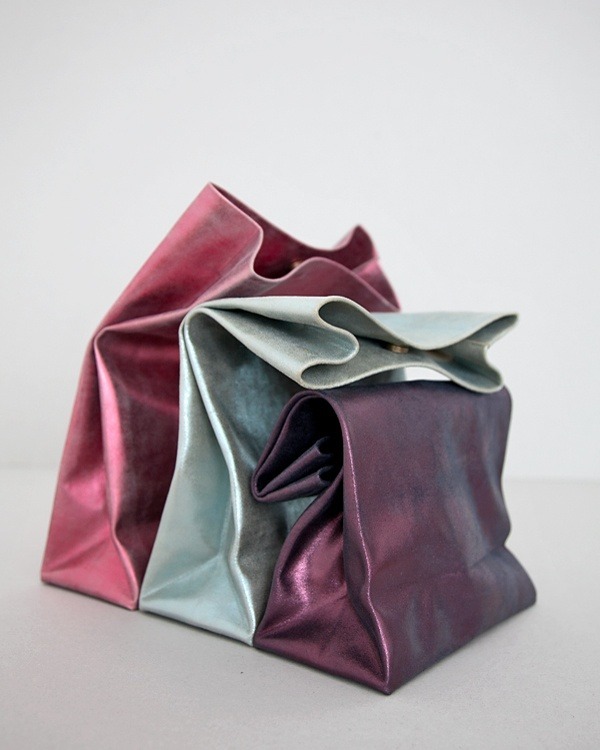 The course aims to give participants a understanding of the various processes and skills used to make a creative 3 dimensional shape in leather. Cost of course is €60 and includes all tools and leather required to make the clutch. 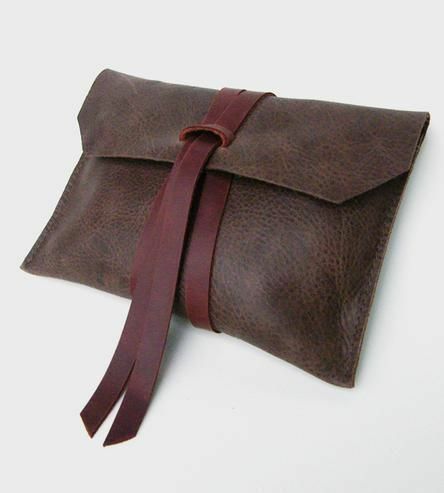 In this clutch bag making course the students will choose from a variety of colours and will learn how to make their own simple envelope leather clutch with leather. Students will also learn how to use a semi-industrial sewing machine and how to work with leather goods. The 3 hour evening bag making course includes tuition and all the materials needed to make your clutch. A range of colours and accessories will be available to choose from. Learn to make a garment from a commercial bought pattern as well as lessons in sewing and alterations. We recommend that you have your own sewing machine. Update or learn new skills in fashion design and sewing, in a fun and relaxed atmosphere. Learning techniques, which will allow you to create beautiful and individual pieces. This course is designed to guide you though the process of making a professionally finished fashion piece. Importance of fabric choice and what to look out for when choosing fabrics. Learn how to set up your machine and to correct any problems with your machine. Learn about measurements and sizing. Preparing fabric, laying out and following patterns. Demonstrating how to adjust the pattern to fit. Basic sewing techniques like darts, seam finishing and installing an invisible zipper. Learn to hand stitch a couture-quality hem. The course is designed to expand your sewing skills while offering a fun, fashion-focused sewing class. You will be encouraged to develop skills in areas of design and practice what you have learned in class before the next weeks class in order to maximize what you get out of this course. Courses must have the minimum number to run, any deposits given if the course does not go ahead will be full refunded. MATERIALS: will be listed upon booking and should cost no more than €20, you will need your own working sewing machine. 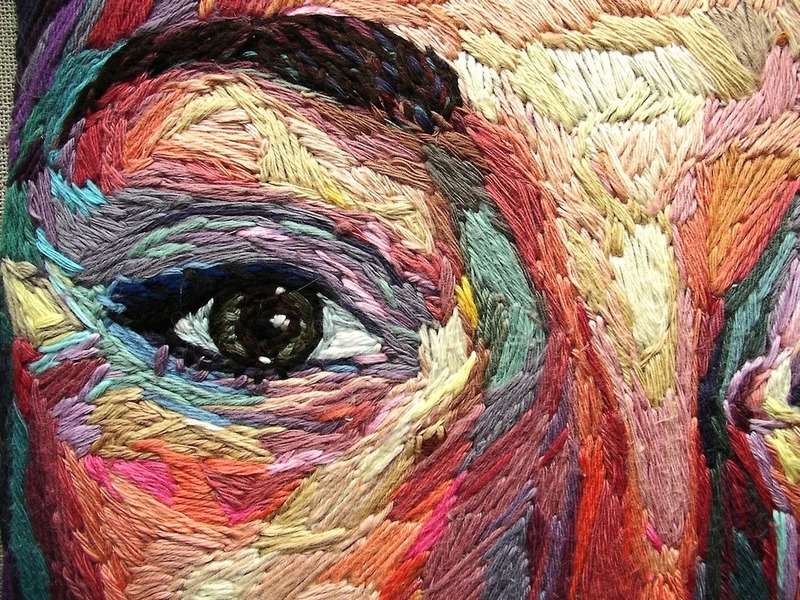 TEXTILE ART- Learn a variety of textile art techniques, such as hand embroidery, machine embroidery, appliqué, Batik, fabric dying and painting. Price includes all material, but we recommend that you have your own sewing machine. This creative and fun course encourages and promotes individual creativity, and teaches you process to produce beautiful creative pieces of textile art in a fun free playful manor. 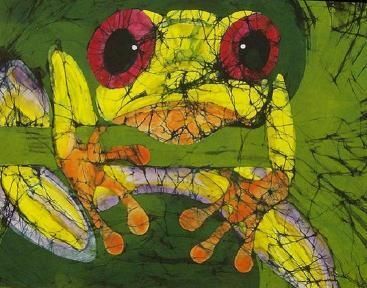 Learn a variety of textile art techniques, such as and embroidery, machine embroidery, appliqué, Batik, fabric dying and painting, which will help assist you in creating your own style of textile art and a mergence of different processes once they are mastered. The course is designed to expand your skills and processes using a variety of Textile Art techniques while offering a fun, open and creative class. You will be encouraged to develop skills in areas of design and practice what you have learned in class before the next weeks class in order to maximize what you get out of this course. All details the same as above course. 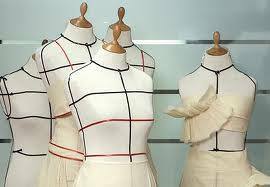 PATTERN DRAFTING- Learn to make your own basic patterns tailor made for your own body. Learn to make your own basic patterns tailor made for your own body. This course covers basic pattern making techniques. Students will develop Base Style Patterns once they have made their own personal blocks Foundation Blocks. 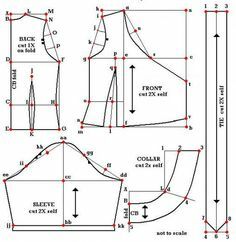 Basic Styles /Silhouettes will be then developed from the Basic Blocks which will include: skirt variations, bodice dart manipulations, a dress and variety of sleeves. This course is suitable for people in the clothing industry or for home users who are interested in learning basic professional pattern making skills. Entry requirements: Some knowledge of garment construction/dressmaking would be an advantage but not essential. 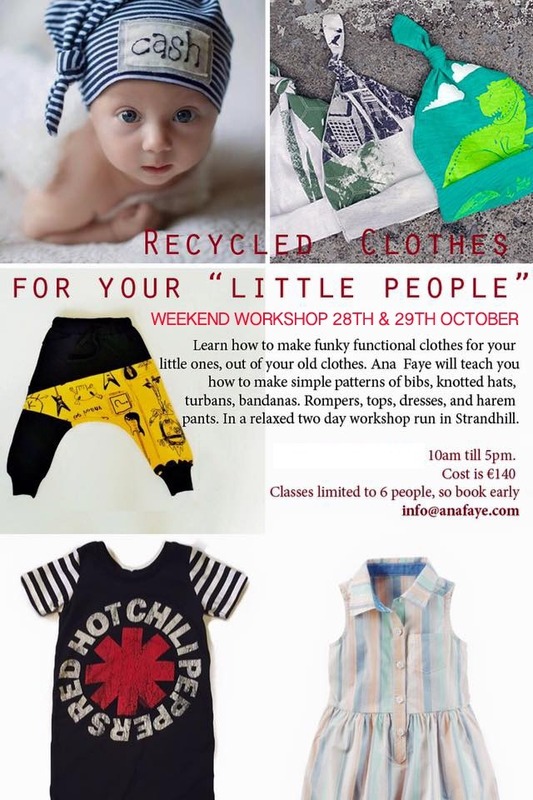 Learn how to make funky functional clothes for your little ones, out of your old clothes. Ana will show you how to make simple patterns of bibs, knotted hats, turbans, bandanas. Rompers, tops, dresses, and harem pants. In a relaxed two day workshop run in Strandhill, Sligo. The course is designed to expand your sewing skills while offering a fun sewing class. You will be encouraged to develop skills in your own time between classes to get the optimum from the course.